Use this form to order CDs and DVDs of the services. CDs are $5.00 and DVDs are $8.00 each. Note - This form is for in-church orders only; we do not mail CD or DVD orders to a place of business or residence. You must pick up your CDs or DvDs from the sound booth on Sunday or Wednesday nights. If you would like both, please check both boxes. Leave blank if you did not check CDs above. Leave blank if you did not check DvDs above. 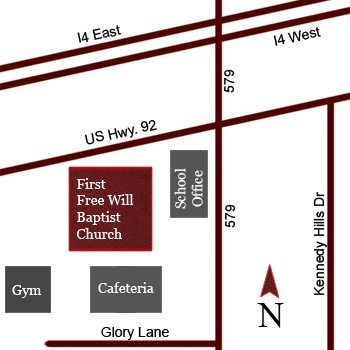 Our church is located on the corner of US Highway 92 and 579 across from the Masters Inn. The address is 11605 U.S. Hwy 92 East, Seffner, FL 33584.